Choanoflagellates are microscopic, heterotrophic single-celled and colony-forming eukaryotes. Occupying diverse freshwater and marine ecosystems, choanoflagellates create a critical link between nanoplankton and larger organisms in the marine carbon cycle. In addition to their ecological role, choanoflagellates are among the closest unicellular relatives of animals and provide important insights into the origin and diversity of animal phyla. The marine choanoflagellate Monosiga brevicollis was selected for genome sequencing because it is easily grown in the laboratory, is available in monoxenic culture, and has been thoroughly considered in phylogenetic studies. The complete M. brevicollis genome sequence will provide a foundation for reconstructing the early evolutionary history of multicellular animals and for interpreting the physiology of these ecologically significant organisms. 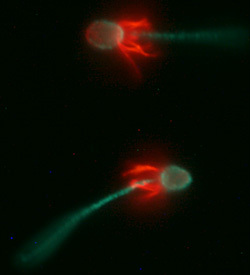 Publication: The genome of the choanoflagellate. Nature. 2008 Feb 14;451(7180):783-8.